Last Updated: November 6, 2018 | Subscribe to our weekly newsletter! How do you get into your hot tub? Sure, you could sit on the side and swing your legs over, unless your spa’s up on a platform. Or maybe you could just climb over the side the same way you climb out of a pool, except that’d probably be painful. Then there’s taking a running start, and … no, scratch that. It’s probably not a good idea. 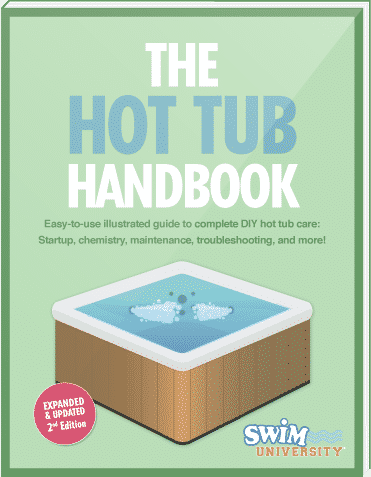 What you’re left with is the best—and really, the only—option for getting in and out of your hot tub: steps. OK, they may not be as much fun as a cannonball, but they’re infinitely safer. It’s just a matter of choosing the right set of steps for you. The hot tub steps you choose need to be able to safely accommodate the heaviest person who will be using your spa. Otherwise, they could break the steps. Even worse, they could fall and injure themselves. Those moving boxes you have lying around in the garage may seems sturdy, but they’re not made to handle the weight of an adult. You’ll need to look for hard plastic resin, which offers the added bonuses of being water resistant and easy to maintain. Or you can buy or even make wooden steps, but they’ll need to be treated or coated with something to protect them from moisture. They’ll also need to be sanded and completely smooth. You don’t want anyone climbing them with bare feet and getting splinters. Yes, weight capacity and material are also about safety, but you need to look for features beyond that. Non-skid tread on the steps. Handrails. Enough width to allow a person to climb them without losing their balance. Luckily, it’s not too difficult to find hot tub steps that offer all of those features and look good while they’re doing it. This little set of steps packs a big set of features. They’re sturdy enough to hold up to 300 pounds If you click this link and make a purchase, we earn a commission at no additional cost to you. , yet are also constructed of a lightweight, maintenance-free resin. At three feet wide, you and your guests should be able to comfortably—and safely—climb the steps in and out of your hot tub. 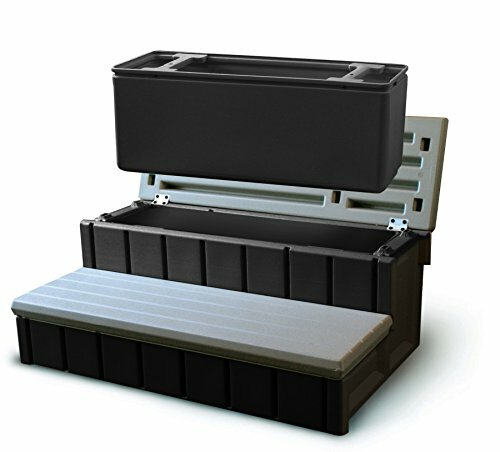 Flip up the top tread, and you’ll find a removable storage compartment where you can keep hot tub accessories, including chemicals. But note that the compartment is not lockable, so think twice about using it for chemicals if you have kids or pets in the house. Made of lightweight but durable resin, these hot tub steps support up to 300 pounds, and measure 36 inches wide and 23 inches deep, offering plenty of space for entering and exiting. The steps come in a stylish two-tone, neutral-color finish to complement any decor. This unit also has a storage compartment If you click this link and make a purchase, we earn a commission at no additional cost to you. to keep your hot tub accessories handy. No more running across the room to get a towel! Doesn’t matter whether you have a round or square spa, these steps will fit. The treads are reversible to accommodate either shape. Plus, the steps are non-skid If you click this link and make a purchase, we earn a commission at no additional cost to you. , adding safety to your entry and exit. They’re made from a high-quality, sturdy plastic, making them durable but lightweight, so you’ll have no trouble placing them right where you want them. Do you get a little woozy about heights? 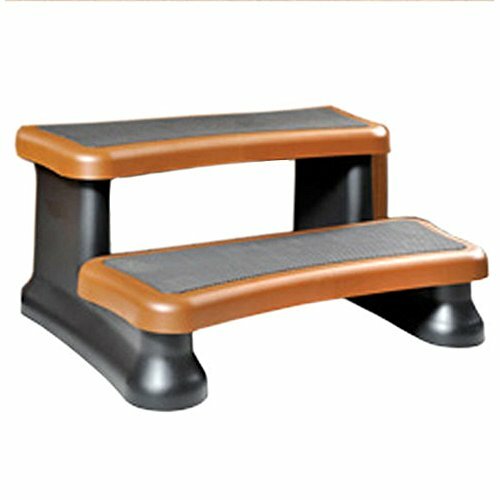 OK, so the top of your hot tub steps isn’t exactly the top of the Empire State Building, but if you feel like you need a little extra stability to keep your balance, a set of hot tub steps with handrails If you click this link and make a purchase, we earn a commission at no additional cost to you. is perfect for you. Plus, the handrails feature drink holders and towel racks. Safety and function in one! 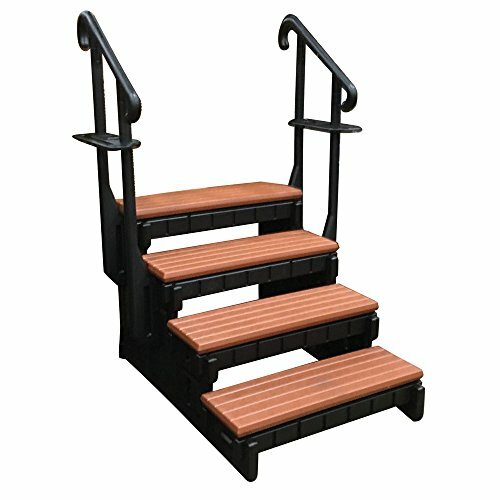 With four steps rather than the usual two, this set of spa stairs is also helpful for entering and exiting a hot tub up on a platform. These hot tub steps are constructed from a heavy-duty, long-lasting, weather-resistant polyethylene plastic, but have a wood-look finish for a more traditional aesthetic. They come in several colors, all UV resistant so they won’t fade in sunlight. Those three-foot-wide steps not making you feel comfortable? 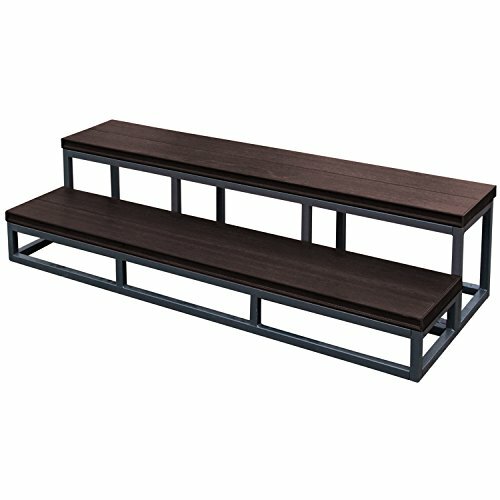 Try these bleachers. OK, they’re not really bleachers, but at 58 inches wide, they could be. You and your guests will have plenty of room to get in and out of the spa. But that’s not even the best part. These hot tub steps are constructed from square steel tubing If you click this link and make a purchase, we earn a commission at no additional cost to you. that’s been welded and powder coated. Then that frame was topped with steps made to look like wood, but created from a heavy-duty synthetic material that comes in three colors, and requires no staining or painting. 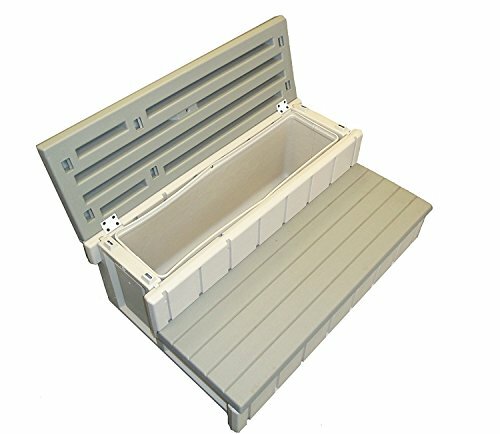 If your main concern for your hot tub steps is that they be sturdy, look no further. These hot tub steps require a little bit of assembly, but the effort will be worth it. They can support up to 700 pounds. Between that and the 36-inch width and 28-inch depth, you could probably carry another person piggyback into the hot tub. (Note: Don’t carry another person piggyback into the hot tub.) They’re made of molded resin which is lightweight, water resistant, and easy to clean. 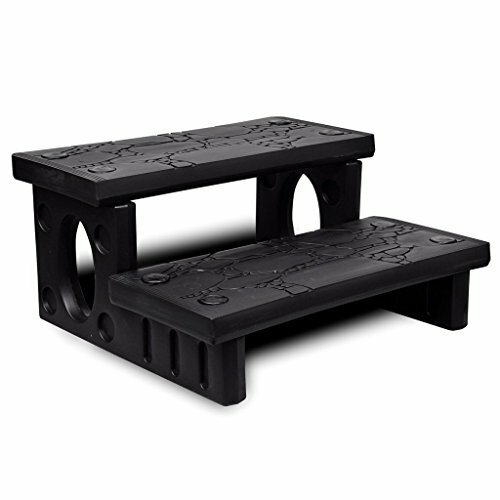 The steps have a spongy rubber, non-slip surface If you click this link and make a purchase, we earn a commission at no additional cost to you. , making them comfy and safe. As a bonus, the top step can be reversed to fit either straight-sided or round hot tubs. They come in three colors: Portobello, Espresso, and Redwood. We can picture the espresso and redwood, but your guess on portobello is as good as ours. Want something a little fancier, but just as durable? Check out these hot tub steps. 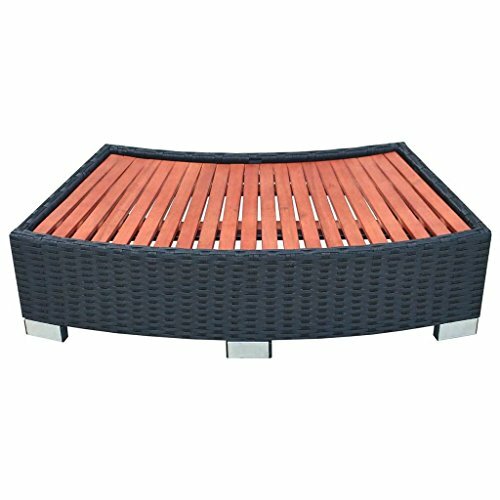 They’re made of rattan and eucalyptus hardwood, and have a natural oil finish, which makes them weatherproof and UV resistant. They’re sturdy, though, thanks to aluminum stands at the front and back, and a powder-coated steel frame If you click this link and make a purchase, we earn a commission at no additional cost to you. . You may even be able to match your patio furniture to it for a complete outdoor ensemble. Whatever type of hot tub steps you choose, just make sure you choose some. No sense hurting yourself, or at the very least giving yourself a nasty wedgie trying to climb into your spa. No one wants to see that. Just select a set that offers the kind of weight capacity you need, is made from material that’s durable but attractive, and above all is safe. After that, it’s just a matter of which ones you like the best. The important thing is, they’ll get you in and out of your hot tub with ease so you can enjoy your spa even more. Privacy, noise protection, and customizable shade. Your perfect hot tub gazebo has it all. Which make-or-break features haven't you thought of yet?